The title says it all. I have a problem- a big problem. I love to eat. Expensive, cheap, whatever I just love to eat. I never thought it was a problem until one day during my 1st year in college I took a look at my monthly statement and say that I spent over $300 just on food for MYSELF in less than 3 weeks. Sad part was that food wasn't even expensive food. I didn't even eat out everyday since I would cook for myself at home sometimes and also eat dorm food. How I managed to rack up my bill so high with drinking boba everyday is still a mystery to me. 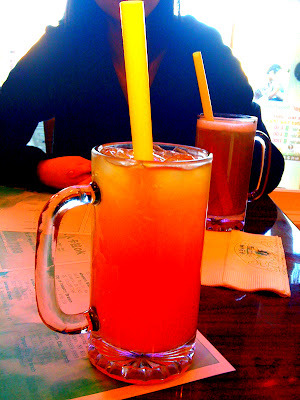 I do, however recall drinking about 2 or 3 cups of boba every other day so I can see how the bill piled up. Well this past weekend I got to relive my first 2 years of college experience which I spent in beautiful La Jolla, San Diego since it was my friend's birthday. I technically only stayed about 1 day and 1/2 so I had to manage my time and my stomach on what I wanted to put in. San Diego Priority 1: Tea Station. Although there are many Tea Stations all over Southern California, the one in San Diego is one of my favorites so I always try to stop by when I'm there. There are about "it" boba places to go to in SD. One is Tea Station and the other is Tapioca Express which I will mention below. So how do you decide which place to go to? Tea Station is known as the FOB (Fresh Off The Boat) Place and Tap Ex is known as the ABC (American Born Chinese) place. No joke for real. At Tea Station everyone speaks Chinese and the majority of the customers buy their drinks and go chill out playing Chinese dice games, Chinese chess, or Chinese checkers- all while bobbing their heads to Chinese music. Awesome... Tap Ex is filled with your typical college kids bringing in their laptop to take advantage of their free Internet. No Chinese music or games though which may be a good or bad thing. This is a picture of their Passionfruit Green Tea with Aloe. You can't actually see the aloe in the picture but its yummylicious self is inside there. They look like white jellies and have a great refreshing, chewy taste. 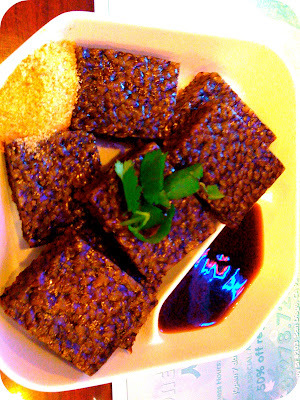 This is a Taiwanese dish: Fried Pig's Blood. As you can see, the outside has that Rice Krispy's texture. The inside was soft and gooey though. Definitely a acquired taste like stinky tofu. Don't go trying it if you can't handle stinky tofu or vietnamese dried blood. 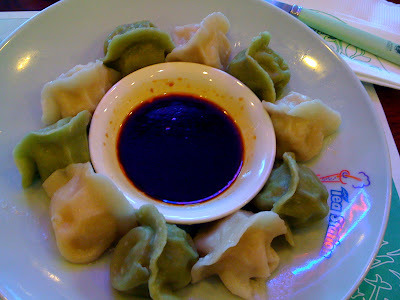 This is Taiwanese tea flavored dumplings. Yes, the dumplings actually taste like tea. I think the tea flavor is in the skin. The green ones tasted like green tea and the white ones just tasted like tea. Destination 2: Nozomi's. 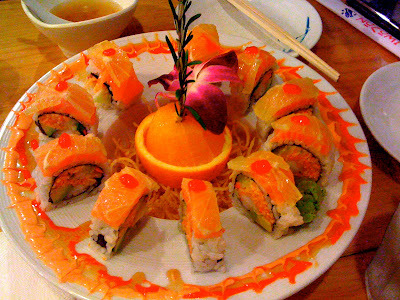 This is their Yellow Jacket Sushi. Delicious. When I used to go here I liked to order their fire rolls, which literally came wrapped in foil and was then lit on fire right in front of you. You would have to wait for the fire to extinguish before bringing your meal of course. Definitely need to go back and order that! Destination 3: Roberto's. This is the awesomeness known as Roberto's. They are open 24 hours-perfect for college insomniacs. This place is pretty filthy and therefore awesome. 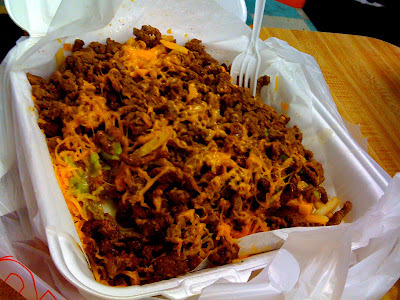 This is a picture of their famous $5 Carne Asada Fries. Look at that beast! Roberto's is also the place to go for a good laugh. Watch drunk girls stumble in coming from the clubs as you are enjoying your carne asada fries and fish tacos. Dinner and a show. Who could ask for more? 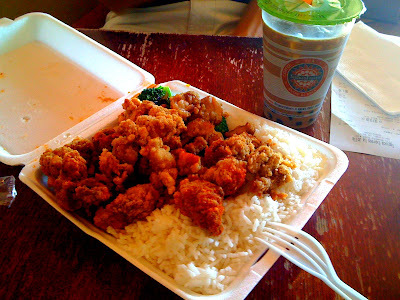 Destination 4: Tapioca Express aka Tap Ex. This is the opposite place of Tea Station that I mentioned earlier. Speak Chinese to these people or ask for Chinese dice and you may just get cursed out and told to go back to China here. This is their Crispy Chicken meal! Comes with rice, veges, fried dumplings, and a boba drink! So like I said before, the first step in solving your problem is to admit you have a problem. Though I have yet to find a solution to my eating problem, I find a even better way of diverting the problem of spending by transferring schools and finishing up college back in LA where I was later allowed to put all my food bills on my Mother's card instead. Sneaky-but when you are an addict you will find any means to get what you want and I wanted a full stomach! I haven't decided yet what to do with the pictures I haven't posted from Hong Kong yet. I may save them for when I go back in 3 weeks so if you are feeling like some good ol' Hong Kong adventures, be sure to look back on previous posts! Happy Eatings and may you do anything possible to get the food you rightfully deserve and desire! Mar 24 Back To Taiwan. The Best Food is From a Dirty Cart!